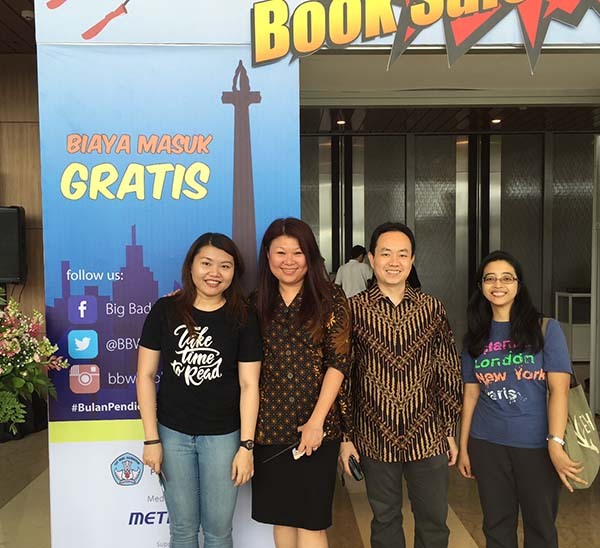 This is the first time I blog after hosting a session of Jakarta Book Club. Book club session, meetup, gathering, chit-chat, or whatever it is called, is simply a monthly event we do on a Saturday or Sunday. 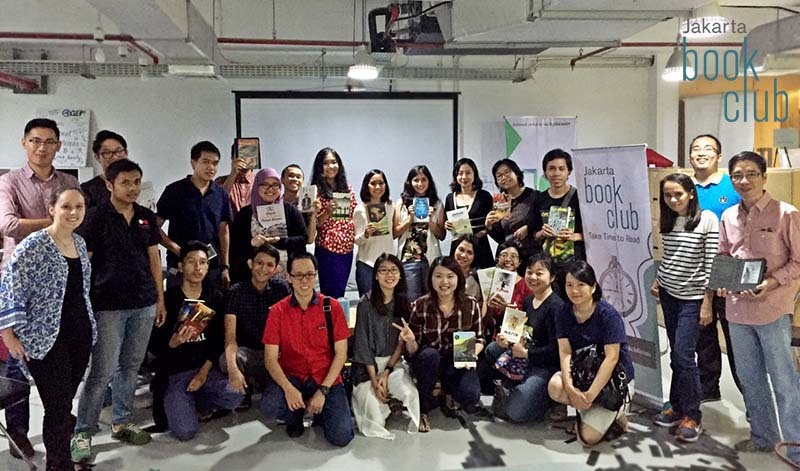 As you know, Jakarta Book Club has been around since 2010, but we officially re-launched our activities in November 2014. Thanks to Meetup.com, our group has grown much more rapidly than when we used Facebook and Twitter alone. 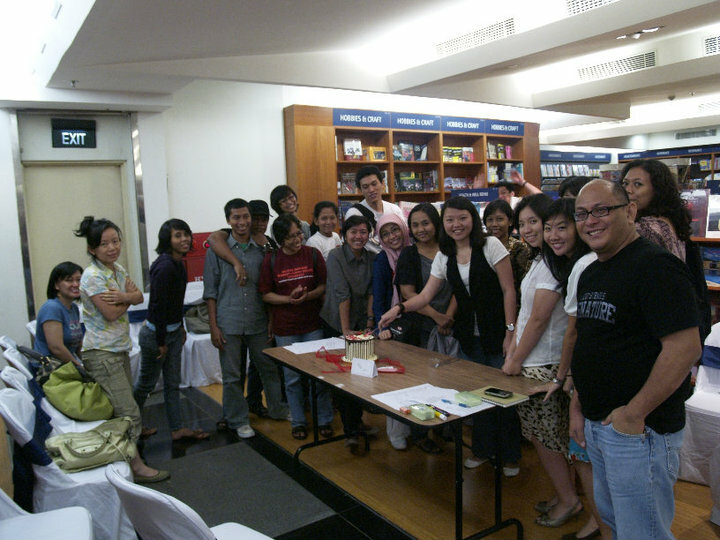 I never forget each person who has contributed to the growth of Jakarta Book Club. The group has reached a number of milestones until we arrived at a certain point of "stability". If you search for a book club or reading community in Jakarta, I think our name would pop up at least once or twice on Google search or social media. We are still growing today, but we already have one another as a "family of readers" in Jakarta. In case you still think that a book club is a boring community, well, think again. Yes, this is a group that gathers a bunch of nerds, myself included, but we came from different ethnics and backgrounds. Most of us are professionals in our 20s and 30s, and we like to keep up with the trends and cool things, just like any cool kids. We are early adopters. We like to discuss books in a light manner, with the accompany of beers and wines. We like cards, board games, movies, concerts, and entertaining stuff like that. When I started this book club, I was triggered by loneliness. In 2010, I had just gone through a sad sad break-up... I'm sure there isn't a "happy break-up", but, you know, that one really affected me in many levels. There I was, young and confused, letting go of someone who was my first traveling buddy, my equal partner, my best friend. A year before that I was so sure about marrying the person and perhaps traveling the world together, but then everything changed. It's true what they say, love is never enough. So I returned to my books, got busy with work, created a network with my own understanding. I started talking about my idea to start a book club and found three people who were willing to help. It did not last for a long time, because we were lacking of resources. My poor salary as a copywriter in a multinational agency couldn't give me the freedom to provide things as much as I wanted. As a perfectionist, I tend to have a bad motto of "better not do it at all then do it half way". So, we neglected the book club, and eventually parted ways. Since I realized that advertising isn't something I want to do until I die, I quit the job. I got accepted right away as a business journalist in an English-language news bureau, and started to manage my money wisely. Something died inside, and I told some of my friends that I was having a "quarter-life crisis". I was afraid of the future, but nobody really took it seriously. "You're still young, you still have a long way ahead of you!" they said. Yet, I thought to myself that I had to do something to make an impact. I have to re-discover myself. I called my friend Casey in the U.S. (not her real name), who used to be my dancing and singing buddy, and told her about it. "Come to New York!" she said. I didn't think twice. I applied for a tourist visa, with zero document in my hands (only a sheet of paper from my company). 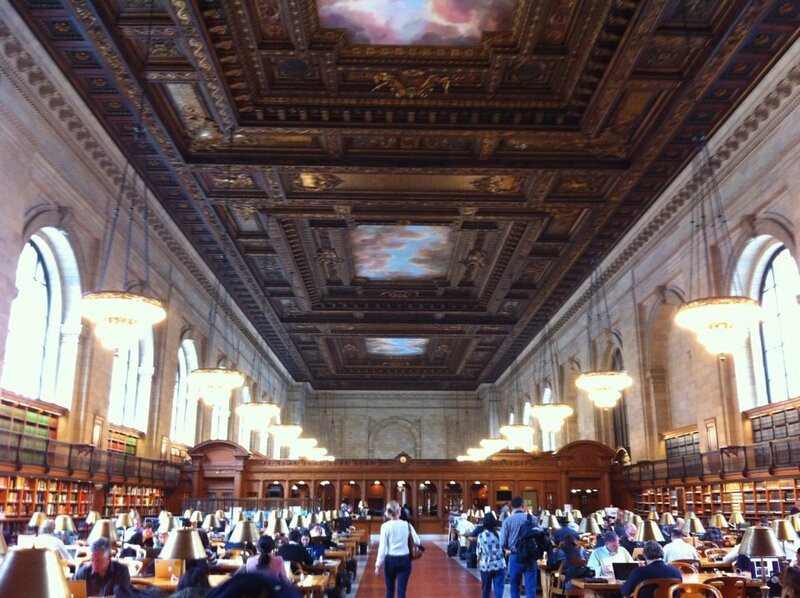 In the application, I wrote that I wanted to visit Columbia University and New York Public Library because "we don't have a decent library in Jakarta". I was really honest about it, and they gave a stamp on my passport. With a limited amount of cash in my bag and no insurance (I never travel without insurance again, by the way), I flew to New York City, stayed in Upper West Side, Manhattan, for weeks, absorbed the aggressive vibe of the city, and learned about many things as if I was taking a Life Course. The art of living. 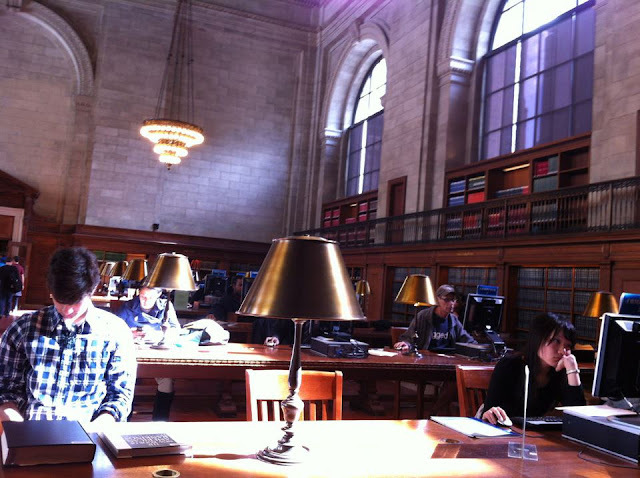 I even attended several classes at Columbia University. I did visit NYPL. Over and over. I spent many hours and days to explore numerous libraries, as well as book stores, in the city. Strand is my ultimate favorite, of course. Knowing that I only had limited money and luggage, sometimes I just read the books right there and then. That's what I like about New York; nobody cares. After that trip, I didn't beat myself as hard. I learned to accept challenges and was determined to change the things that I can. I'm sure everybody has probably gone through things like I have. One of our members, Ernest, confessed in a radio interview that he was feeling lonely when he couldn't share his findings after reading a book. Even if some of us go to a book club to find new friends or potential soulmate, why not? "Whatever floats your boat, man," someone said. I know that for that person, the idea of picking up a date in a book club is "lame". Well, I'm sure it would be better (and faster) to pick up one from Tinder. In a book club, at least you can see how smart a person is by the types of books he or she is reading. Lol. So, if you are new in town, single and looking, don't be shy about meeting new friends at Jakarta Book Club and asking them out for a drink. Meeting people who have similar interests could be very difficult outside college and work place. First impression does count, though, so be sure to maximize your assets! A week before JBC meetup or few hours before you leave the house, it won't hurt to read one of the books that will be reviewed in the book club and prepare to say smart things or quote something from the book. Brainy people, my friend, can be sexier than bodybuilders. First of all, you shouldn't lie about your relationship with books. Although a book club community could appear intimidating at times, you don't need to "fake it 'till you make it". If you do not like books or haven't read Jane Austen or Ernest Hemingway, just don't say anything. The simplest way to participate is by coming late to the meetup and joining the "sideline" chat on WhatsApp group. Eventually, people would know that you are not an avid reader. 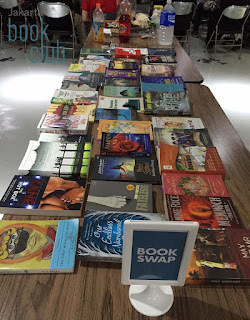 Many book club "virgins" asked me, "What should I bring to a meetup? I've never joined a book club before." Don't worry, there is no right or wrong about participating in a book club. All you have to do is read the notes and instructions stated on the meetup page, e.g. bringing a book for swap. Once you arrive at the meetup, you will hear some people sharing about a book that they have enjoyed reading in the past. It could be boring – because not everybody is born with a gift of public speaking – but appreciate them anyway. You can get rid of your bored look by asking funny questions or munching any snack that comes your way.